At the VTA Board of Directors meeting on November 1, the Board passed separate Multimodal Improvement Plans (MIP) for the City of Mountain and City of Santa Clara. The MIPs had also previously been approved by the respective city councils in September 2018. 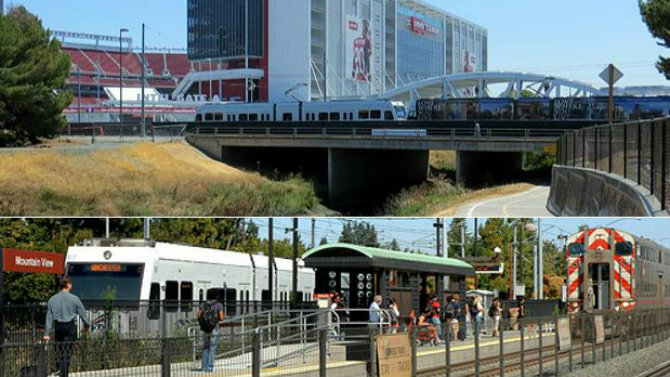 These two plans demonstrate the ongoing collaboration between VTA and the cities of Santa Clara County to promote multimodal improvements (e.g., improvements to transit, pedestrian and bicycle facilities) to help address the effects of upcoming growth. VTA administers the state enabled Congestion Management Program (CMP) for Santa Clara County. It requires that Member Agencies, such as cities, prepare a deficiency plan for CMP system facilities (e.g., key arterial roadway or Expressway intersections) located within their jurisdictions that exceed the CMP traffic Level-of-Service (LOS) standard E.
Since the 2013 update of the CMP, VTA has referred to deficiency plans as Multimodal Improvement Plans (MIPs). The process for approving an MIP requires Member Agencies to first adopt their MIP, and then submit it to VTA for final approval. MIPs should improve system-wide traffic LOS, contribute to a significant improvement in air quality, and demonstrate innovative, coordinated and comprehensive transportation strategies that reinforce community goals. These plans “trade off” making traditional roadway changes, such as widening an intersection or roadway, with offsetting improvements at other locations to improve transportation conditions for walking, bicycling, and using transit, while still serving autos on the CMP transportation network. The Action Plan is the core of the MIP. The plan lists the MIP actions and presents how they will be implemented, including funding sources and estimated timing for implementation. The City of Mountain View developed an MIP to address projected congestion associated with the build-out of the Mountain View 2030 General Plan and subsequent Precise Plans. The City of Mountain View consulted extensively with VTA and other affected agencies including the cities of Palo Alto, Los Altos and Sunnyvale, the County of Santa Clara, and Caltrans. The actions in the Mountain View MIP are designed to improve multimodal circulation, establish programs to reduce vehicle trips, manage parking, and create plans for infill, transit-oriented developments. The estimated cost of the projects in the Action Plan totals nearly $600 million, which includes nearly $34 million in Completed, Underway and Funded Projects; $114 million in Future Projects Using Existing City Funding Sources; and $450 million in projects funded by a new citywide Transportation Impact Fee (TIF) and Supplemental Sources. The City of Santa Clara developed an MIP to address congestion at seven CMP intersections associated with the City Place project. The City of Santa Clara consulted extensively with VTA and other affected Member Agencies. The estimated cost of the projects in the Action Plan totals nearly $23.4 million. The MIP action items will be funded primarily by the Related Santa Clara LLC (“Related”), the developer of City Place, because the City Place project triggered the need for the MIP. A Development Agreement between Related and the City provides for up to $20 million in funding from Related, and up to $6 million from the City’s funding sources. For complete information on the Mountain View or Santa Clara Multimodal Improvement Plans, check out the November 1 Board of Directors agenda. The Mountain View plan begins on page 58, while the Santa Clara plan begins on page 148.